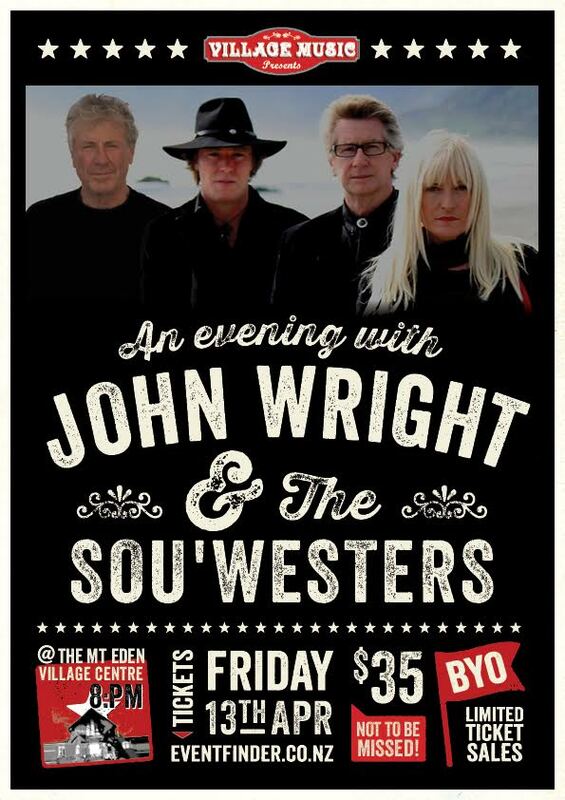 New Zealand cricketing great John Wright with The Sou’Westers play The Mt Eden Village Centre - John Launched his debut album Red Skies at a concert in Motueka in 2017 and returns to the stage in 2018 with his insightful songs and stories about travelling the world as an international cricketer and coach. THIS IS IT! 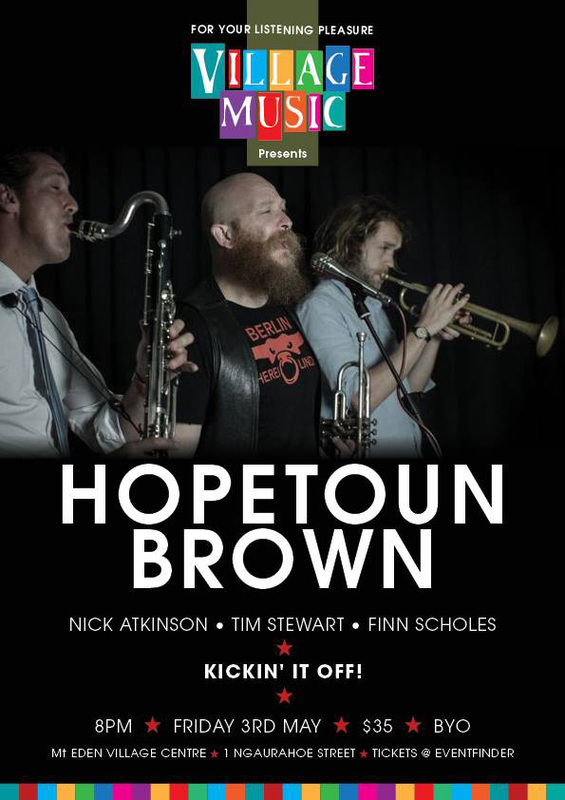 - We're kicking off this year's winter series of soirées with the welcome return of HOPETOUN BROWN! Get your ya yas out for this one folks - these guys rock. Their last VM concert was a full house and we're looking forward to the same for this show, so don't dilly dally! See you all on MAY 3rd! We'll post the ticketing link below, just as soon as they go live on Eventfinder. If VillageMusic is one thing, it's eclectic - and for our 2018 season finalé, we're bringing back the jazz! For the first time to our stage we have Neon Quaver - David Lines, Richard Adams, Nigel Gavin and Richard Ghent who are now developing the unique quaver sound, of electro acoustic instrumentation with no rhythm section, in preparation for recording in early 2019. Their repertoire ranges from original instrumental compositions that are melodic and rhythmical, in the flavour of Lyle Mays and Keith Jarrett with a number of covers from Rickie Lee Jones, Split Enz, Sting etc; that are particularly suited to the instrumentation and vocal range the quavers explore. And to make the evening even more enjoyable, we are real pleased to bring both the Gitbox Rebellion back for another gorgeous turn on the turkish rugs and the extremely talented Caitlin Smith, who has also graced the VillageMusic stage on more than a coupe of occasions - It's like having family comin' along! 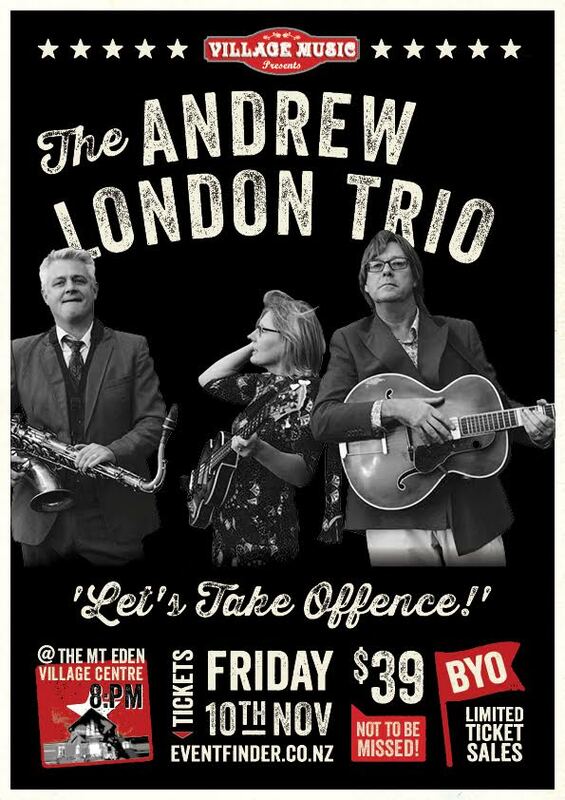 This will be a very fine listening treat of a Friday night and a perfect way to end the week - See you there! This will be a cracker. Rikki Morris has a New Zealand musical pedigree as long as your arm, not just as a fine songwriter, studio producer and performer, but also as a great live sound engineer. 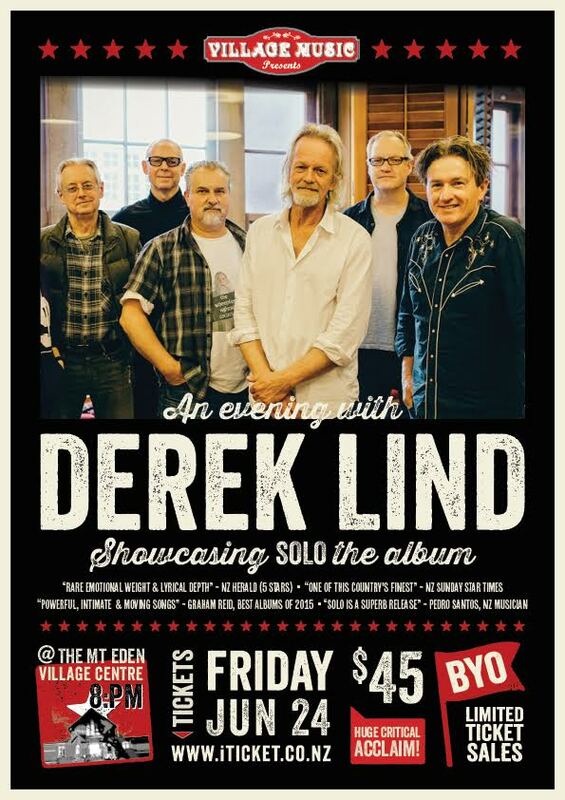 It's not often we get to enjoy a full performance of Rikki's work and Village Music is especially proud to host Rikki and his band for one night only. 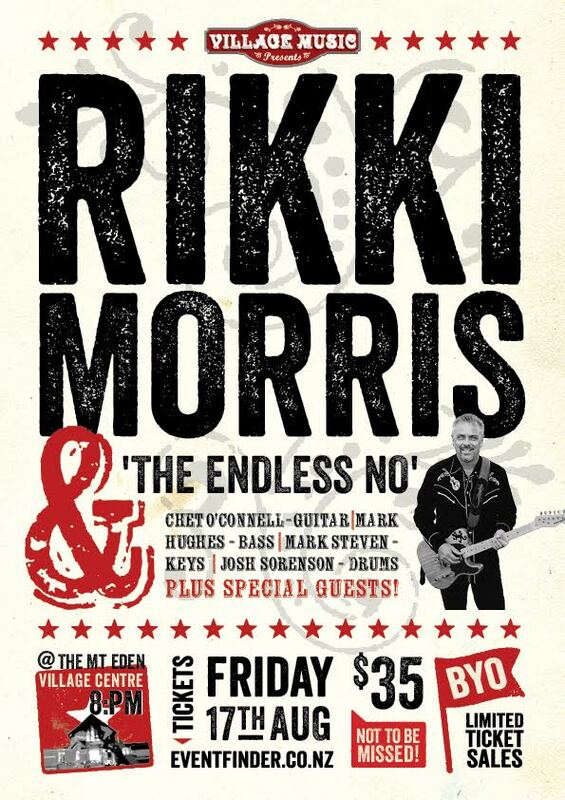 Named after a lyric in one of his brother Ian’s original songs, Rikki will be joined by his band ‘The Endless No’. Chet O'Connell - guitar, Mark Hughes - bass, Mark Steven - keys, Josh Sorenson - Drums. ‘Time to put the band back together, hit the stage and share a lifetime of songs amongst friends in an intimate setting’. This will be a night to remember for sure. Definitely not to be missed. See you on the night. 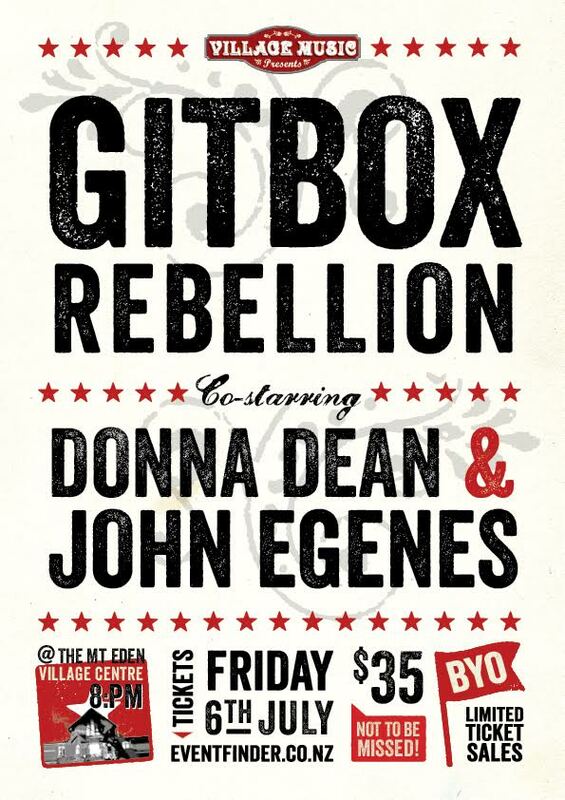 And what a fine line-up we have for this concert - Nigel Gavin and the amazing GITBOX REBELLION, along with Donna Dean and our special guest John Egenes. This will be a great ‘listening concert' for sure! New year’s greetings to all you Village Music supporters and fans. 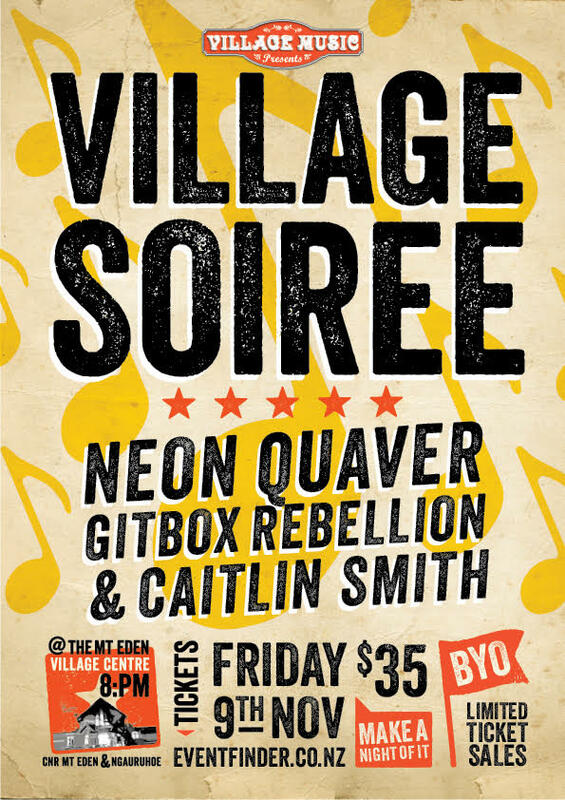 This year will mark our 8th year of bringing live music to the old Mt Eden Village Hall. (aka The Mt Eden Village Centre). To kick off this year’s season we have an extra special treat with the return of Mark Mazengarb to the Village Music stage, along with Joe K. Walsh & Andrew VanNorstrand, directly from the USA. To say that Mark is a virtuoso guitar player is putting it somewhat mildly. If you were fortunate to be able to attend our previous show with Mark & Loren Barrigar back in 2013, or if you’ve heard Mark on RNZ, you will know just what I mean. 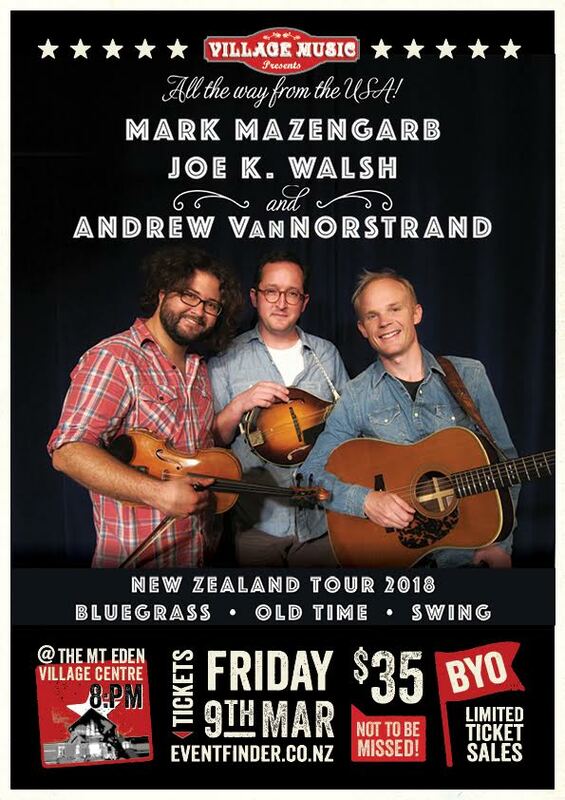 So when Mark brings a fiddle player and a mandolin player over from the States to join him in concert - you just know that we are all in for a listening treat. 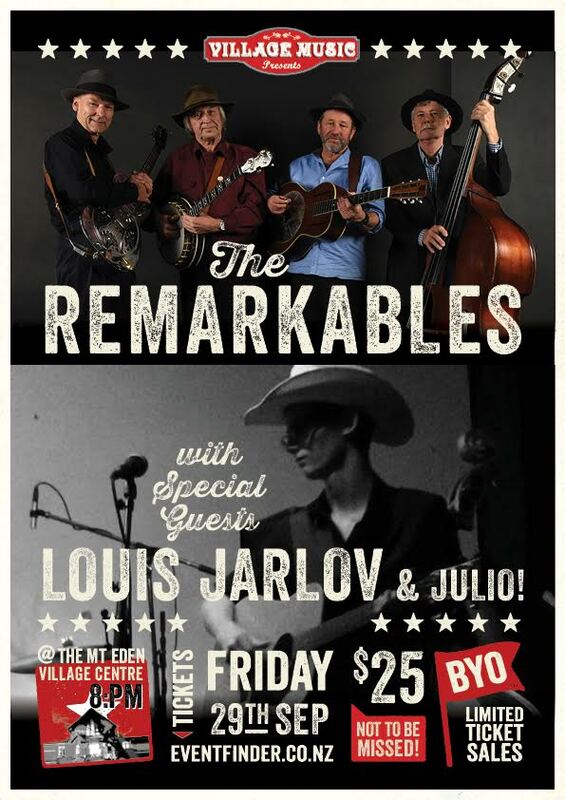 As curator of these concerts, I can honestly recommend this as a great way to spend a Friday night - bluegrass and western swing are musical genres close to my heart and these guys are right off the top shelf. As previous Village Music goers, you know just what a great night our soirées always are, so as we always say - Bring your ears, bring friends, bring family, BYO, grab a table and settle in for a great Friday night of conviviality and live music. Sarah delivers a deeply moving performance. Her powerful voice and soulful songs explore the road back from stardom and the inner journey to the heart. We experienced atmosphere, real emotion and rare simpatico as Sarah weaved her magic with her seasoned, hand-picked band. It was wonderful to hear this consumate professional play those ever familiar tunes along with some great new stuff all accompanied by an equally professional band. That was a great night! 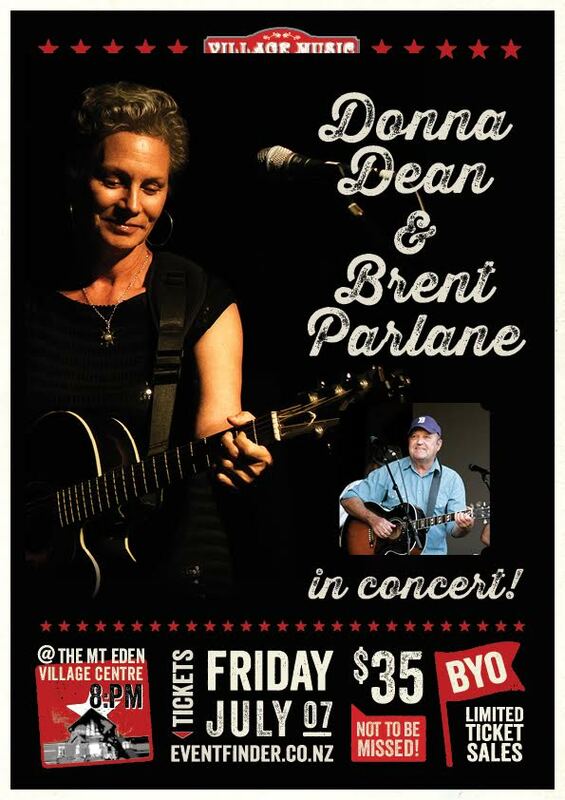 Real pleased to welcome Brent Parlane (ex Melbourne and currently on a world tour) to our concert series and to bring Donna Dean (Tui winner) back to our stage. Donna was one of our first concert performers for VillageMusic and what a great night that was. Following that performance, Donna has won a Tui, been the subject of a documentary, played Nashville and released a whole lot of new material. Brent Parlane is one of our great musical exports. 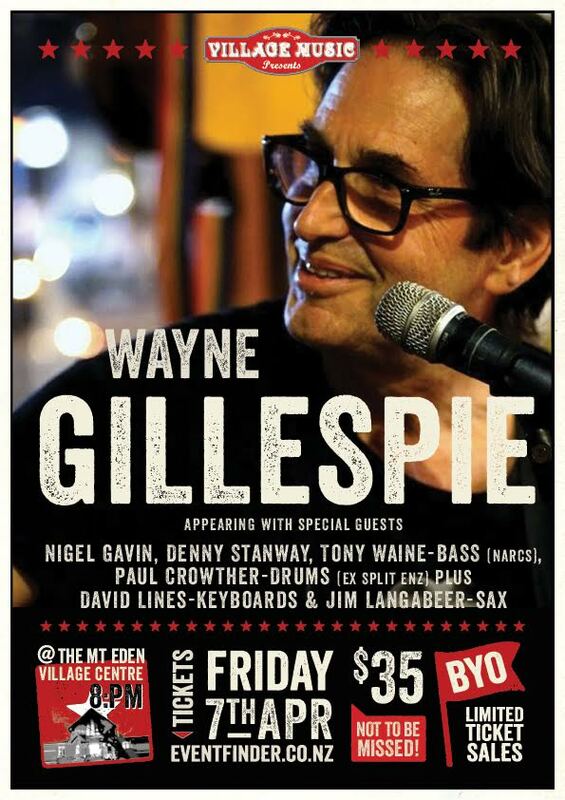 Many of us will recall his famous days in the New Zealand country music scene. Brent plays regularly around Australia and has maintained a steady output of original music to a loyal fan base. 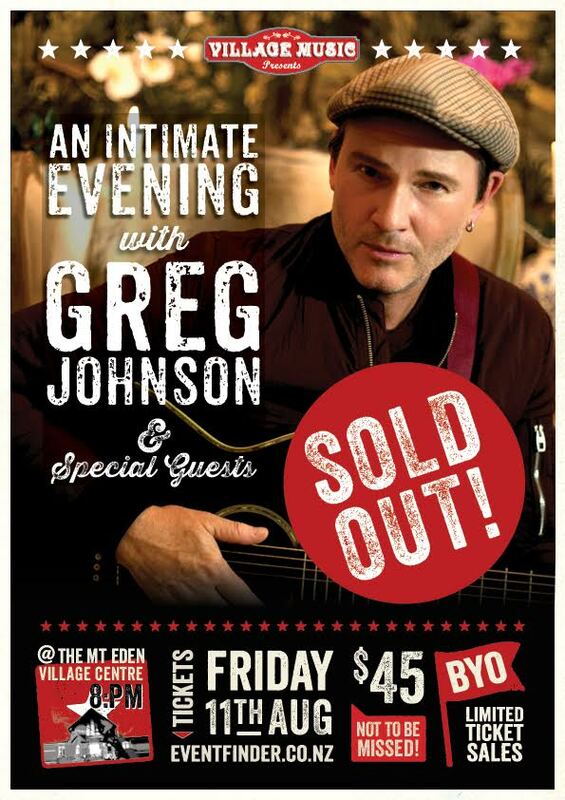 Donna and Brent have performed together in Melbourne and for this show will be joined with a couple of guest musicians for backing on bass and guitars. This will be a very special evening. As always, bring friends, bring family, bring your ears and BYO. The next soirée of this winter series is stealing up on us quite quickly! Got a very interesting show lined up for the next evening - Hailing from beyond the Bombay Hills, Slippery Noodle have been steadily crafting their own infectious soundscapes for the past eight or so years. 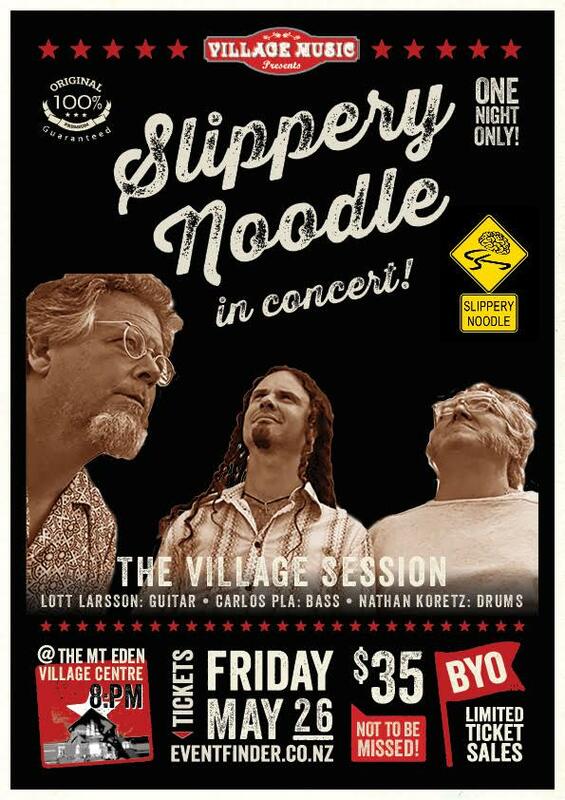 Lott Larson is well known around Auckland's folk and jazz scene, for his virtuosity on a number of instruments, including bass and guitars. He is ably joined by two very fine musical compadres: Carlos Pla on bass, originally from Montevideo in Uruguay and Nathan Koretz on drums and percussion, from Otorohanga. Together they weave their way through original tunes and some standards, dished up 'slippery noodle' style. This will be a great ol' dress-up night for sure. Dress to impress and come to groove - these guys are a treat. 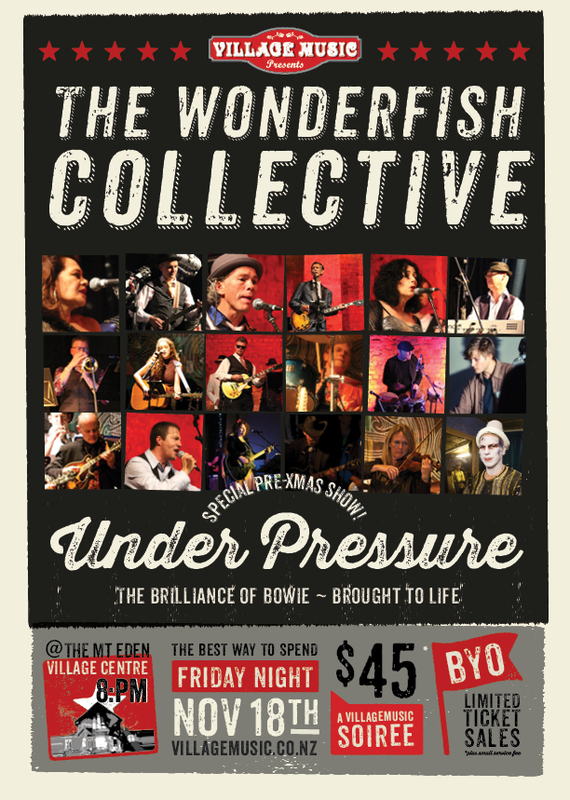 The Wonderfish Collective have a great line-up of real talent on board. They're great to listen to and they're great fun with it. That's what Village Music is all about - Great live music, plenty of conviviality and an opportunity to really relax and have a good 'listen', up close with the musicians who are making the music. This was a special pre-Christmas concert event for Village Music, following a couple of sold out nights on the North Shore. In keeping with the ethos of these guys, they were once again raising funds for a good cause - this time, on North Head, where there is a need for rescue equipment. 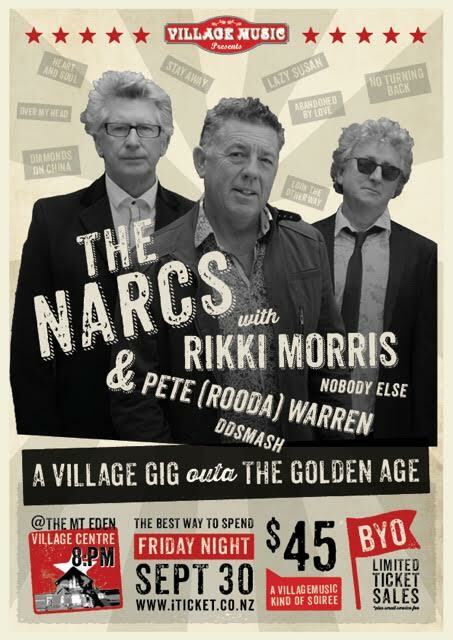 And now for something completely different… In keeping with all that is eclectic, VillageMusic presents the NARCS - A Village Gig. This was a great night - there was even be dancing - of course! 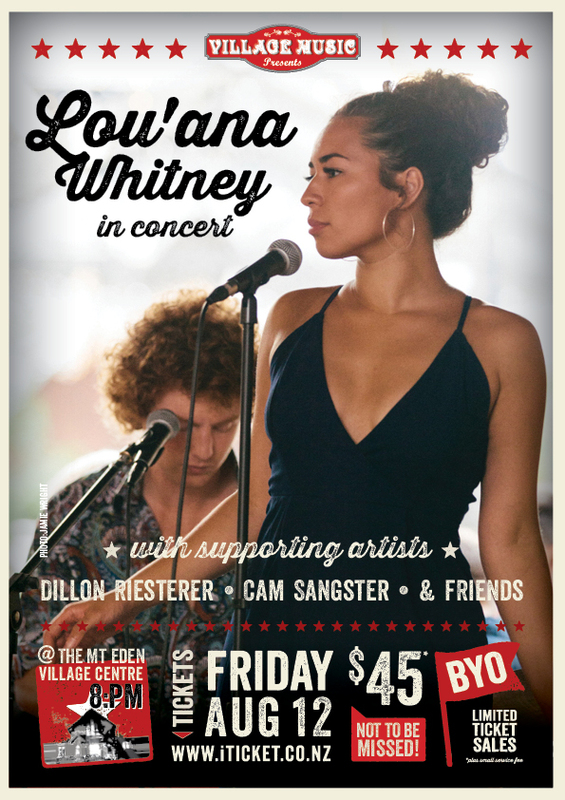 In keeping with our Village Music passion for stunning female vocalists, we are delighted to bring Lou'ana Whitney and her band to the The Mt Eden Village Centre. Lou’ana has been steadily forging a reputation as a great talent for the past few years in various soul/funk/jazz bands and musical collectives around Auckland. Lou’ana brings a vocal style and a gorgeous delivery that oozes with great feel and character, add to that the musical skills of Dillon Riesterer, Cam Sangster, et al and this promises to be a really delightful evening. Lou'ana and the band are already rehearsing for it! Can't think of a better venue than the old hall for these guys - and a Village Music Soiré is the perfect way to enjoy it. Expecting numbers to be quite high, so get tickets sooner rather than later. Glenn Ross Campbell (Weissenborn Lap-slide). Most recently heard on Radio New Zealand a few weeks ago, Lind has played at major arts and music festivals both overseas and in NZ. He has supported international acts such as Sam Philips, Michelle Shocked, and the Hot House Flowers. His music is in the tradition of the singer-songwriter, drawing its influences from blues, country and rock music. Influences include Dylan, Neil Young, T-Bone Burnette, John Prine, Springsteen, Elvis Costello, Richard Thompson, Peter Case, John Hiatt & Van Morrison. This was be a concert that will linger in the memories - there aren’t too many opportunities to have a really good listen to these guys live - and we’re thankful to have welcomed them to our family.